I’ve been thinking a lot lately about what makes a cookbook great. Deb just wrote about what makes a recipe great, and, as usual, she articulates with aplomb thoughts that have rattled around aimlessly in my brain. But my favorite cookbooks are more than collections of great recipes. They give me entree into the mind of the person who created the recipes. They offer not just the hows but the whys of cooking. They have tons of useful information tucked in the front and back matter. They have headnotes with every recipe that give me an overview of what kind of undertaking I’m getting into and that clearly describe what I’m going to get out of it. 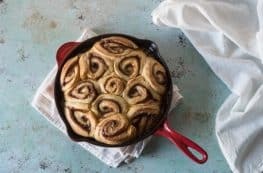 My favorite cookbooks offer jumping off points for how I can use their techniques in other dishes. They don’t just offer good results with their recipes, they make my cooking better overall. 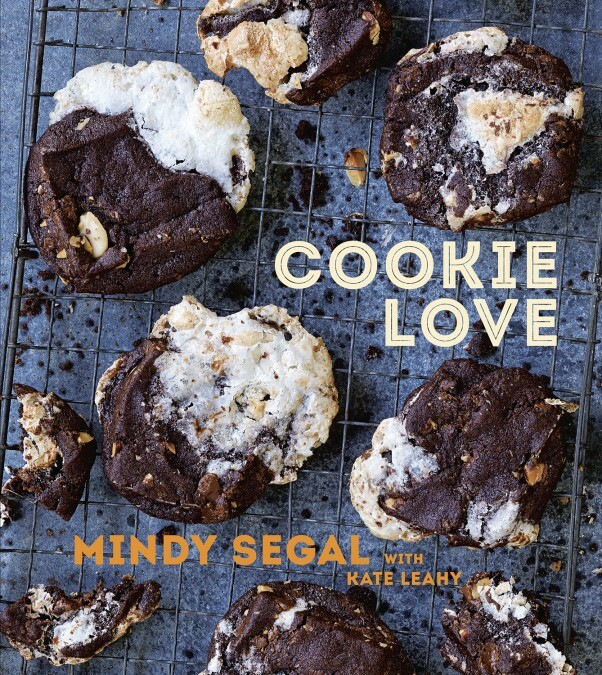 Mindy Segal’s Cookie Love ticks many of those boxes and is quickly earning a spot on the shelf among my favorite cookbooks. It’s easily my favorite cookie book. When I heard that Segal, the pastry chef behind the popular Wicker Park restaurant and killer dessert spot Hot Chocolate, was coming out with a cookbook, I couldn’t wait to get my hands on it. Her restaurant offers the kind of desserts that surprise while remaining comforting and pleasurable. It’s the kind of place that produced desserts that even won over my friend who didn’t eat chocolate. So I’m saying my expectations were high. When I flipped through the book, I was impressed by the creativity on display in the recipes. While it includes classics like chocolate chip cookies, brownies, and snickerdoodles, it also includes recipes for things like lemon goat-butter tea cakes, smoked almond shortbread with orange blossom and raspberry framboise, and red wine and ginger pear butter kolachkes–modern cookies with refined, sophisticated flavors that I haven’t seen anywhere else. They’re the kind of fresh ideas that make me want to put on an apron and preheat the oven (and also rethink my personal no tattoo sleeve policy). There were easily a dozen recipes competing for first to try. I started with citrus and brown butter shortbread, which were melt-in-your-mouth tender with a richness from the brown butter and a brightness from the mix of citrus zest. Then I moved on to the banilla nillas, a tender vanilla cookie sandwiched around a banana butterscotch filling. They get dipped in bittersweet chocolate and drizzled with streaks of caramelized white chocolate. They’re the kind of cookie I would happily serve as a plated dessert at the end of a dinner party. And her butterscotch sauce is the kind of thing I might, uh, have eaten spoonfuls of on its own. 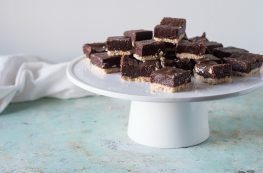 I love that Segal uses generous amounts of vanilla extract (I often double the vanilla in a recipe, but there’s absolutely no need to do so here) and a mix of kosher and flaky sea salt, which imbue the cookies with a subtle richness and added texture while balancing out their sugary sweetness. There’s plenty of great information at the beginning of each chapter. Some things I already knew, like resting dough for drop cookies overnight allows the flour to hydrate more fully and improves the texture of the finished cookie, and some things I hadn’t heard, like an inexpensive pastry roller works better than a rolling pin for evening out small stubbornly thick areas in shortbread. I love that each recipe includes clear instructions on when to rotate pans in the oven and whether to transfer cookies to a cooling rack or to cool them on the pan. Segal is dyslexic and learned to bake by looking at lists of ingredients and a picture and lots of trial and error (and eventually culinary school at Kendall), but not, primarily, from reading about it. It’s perhaps not surprising then, that her methods sometimes veer from standard cookbook techniques. She calls for measuring flour by scooping the measuring cup into the flour and leveling it with a straight edge rather than using the spoon-and-sweep method. The former method produces a cup that weighs about half an ounce more than the latter method. I wish these recipes included weight measurements because it’s so much more accurate and would make the book much more accessible to an international audience. Segal also calls for extra large eggs, rather than standard large eggs. After researching the difference between the two, I determined that they’re close enough and variable enough in size that large eggs should work in a recipe that calls for one or two eggs (and I used large eggs in the recipes I tried with great results), but if I were to double or triple the recipe for a big batch, I’d definitely go with extra large eggs so as not to throw off the proportions. My other quibble is perhaps a silly one, but I get annoyed when the picture featured with a recipe doesn’t match the instructions in the text. The citrus and brown butter shortbread recipe shows cookies dusted with powdered sugar in a crosshatch pattern, apparently produced by using a cooling rack as a stencil. The picture and the pattern attracted me to the recipe, but nowhere does the recipe mention finishing the cookies in this way, even as an alternative option (it leaves them unadorned). I felt a little misled. The picture with the banilla nillas shows one cookie dipped in white chocolate and drizzled with bittersweet chocolate amidst the ones dipped in bittersweet and drizzled with caramelized white chocolate, but the text never mentions this either. (Tim has a cogent critique of the overall style of the book in his excellent review.) I could make the argument that the picture is meant to evoke other possibilities for the recipes, but really, I expect my cookies to turn out like the picture, minus the weathered wooden cutting board and vintage egg beater. Still, this is an excellent cookbook. Segal and her co-writer, Kate Leahy, have written a book that’s been in such frequent use in my kitchen in the few weeks I’ve had it that it’s already spattered with bits of melted chocolate and flour debris, which is pretty much the highest compliment I can give a baking book. I’ve chosen to share the recipe that Segal says is her favorite one to exchange with others. It’s a bar cookie that comes together quickly and that avoids the treacly sweetness that can sometimes overpower pecan pie by using sweeteners with complex flavors (I might even swap in muscovado for the dark brown sugar next time) and balancing them with the mild bitterness of the walnuts and a generous amount of salt. It’s a winner. THIS IS MY OFFICIAL barter recipe. If I ask anyone for a recipe, I hand over this one in exchange. Everyone needs a good nut bar, and this one comes together quickly. The shortbread base is baked all the way through while the nut caramel iscooked on the stove and then poured onto the cooled base. After it has cooled, it’s ready to be cut. (Do not refrigeratebefore cutting or else the nut caramel becomes rock-hard.) While using a knife to cut the bars is best for yield, sometimesI punch the bars out using a rectangular cookie cutter to get a cleaner edge. 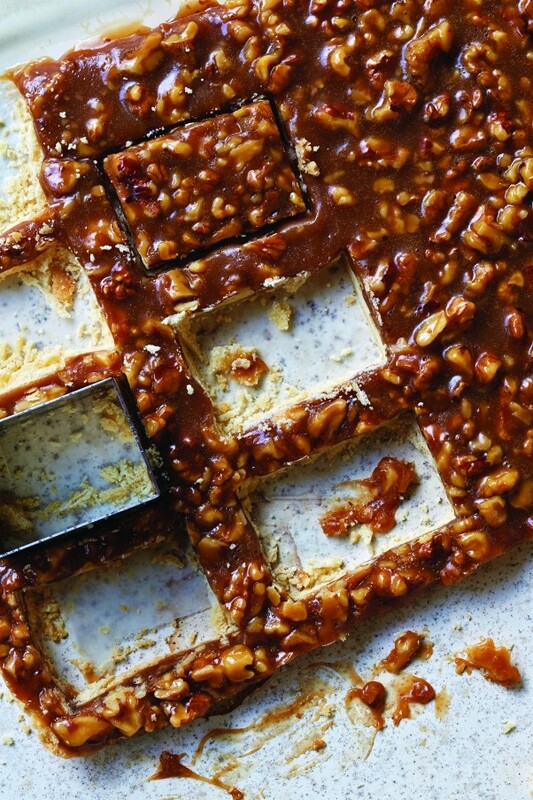 Any kind of nut can be used for these bars,but honey and walnuts are naturals together. To make the shortbread: Heat the oven to 350°F. Lightly coat a quarter sheet (9 by 13-inch) pan with nonstick cooking spray and line with parchment paper, leaving 1 inch of overhang on the long sides.In a stand mixer fitted with the paddle attachment, mix the butter, sugar, flour, and salt on low speed until the dough starts to resemble pebbles, approximately 6 minutes. Put the shortbread dough into the prepared pan. Using your fingers, press the shortbread into the pan, being sure not to ignore the corners. Cover with a piece of plastic wrap. 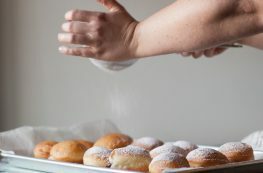 Using a pastry roller, roll the dough into submission to even out the surface. Refrigerate until chilled, 20 minutes. Remove the plastic wrap. Bake the short- bread, rotating the pan halfway through the baking process, until golden brownand baked through, 25 to 28 minutes. If you notice it puffing up as it bakes, press it down gently with a clean kitchen towel and continue baking it. Cool to room temperature. To make the walnut caramel: Attach a candy thermometer to a 3-quart heavy saucepan. Melt the butter over medium-high heat. Using a wooden spoon, stir in the honey, sugars, vanilla, and salts. Heat the mixture, stirring often, to 220°F, approximately 3 minutes. Pour in the cream and cook, stirring often, to 238°F, 1 to 2 minutes more. Stir in all the nuts and cook until fragrant, 2 to 3 minutes more. Pour the nut caramel over the short-bread and spread with an offset spatula. Let the nut caramel cool completely. Lift the bars out of the pan using the parchment handles and transfer to a cutting board. Cut into 4 strips length-wise and 6 strips crosswise. The bars will keep in an airtight container at room temperature for up to 1 week.